We have a wide section of 1/2” rope capacity pulleys useful for redirects, light rigging, rescue, and mechanical advantage systems. We have more pulleys at the following links; many of which also make excellent small pulleys like those below. Many of the most compact 1/2" pulleys are located on our hitch-tending pulleys page, but they also make excellent small rigging and rescue pulleys. Arborist blocks with meant to attach directly to a sling and with features better-suited to tree rigging are found on our arborist block page. Redirect your doubled climbing line with this double re-direct pulley from ISC. This is the easiest way to redirect your doubled line, with swinging side plates and side by side aluminum sheaves. With the swing cheek design this makes for a great addition to DdRT redirect setups. Open the pulley slap both legs of rope in hook it up and have a more efficient redirect allowing for that optimum line angle. The angled design of the upper side-plates keeps the ropes captive and running correctly on the sheaves. This pulley is made from lightweight aluminum and is nice and compact so that it won't take up much room on your belt. Breaking Strength 6,744 lb (30 kN), 1/2” capacity, 1 3/4” x 3”, weighs 4.4 oz (126 g). Incredibly high strength in this compact and sleek micro pulley. Rounded anchor holes work great with custom spliced terminations or carabiners. Fairlead flares and rounded cheek plate edges help maintain high working efficiency, and attachment holes reduce the probability of carabiner rotation. Breaking strength 11,250 lb, 1/2” capacity, 3.75” tall by 1.75” wide, weighs 4.oz. This spacer is designed to be used with the DMM Pinto Pulley to keep the side plates from pinching together when used with ropes at the suspension point. High strength and sleek design make the DMM Pinto Rig Pulley a great addition to your gear bag. Rounded anchor holes work great with custom spliced terminations or carabiners. Fairlead flares and rounded cheek plate edges help maintain high working efficiency, and attachment holes reduce the probability of carabiner rotation. Breaking strength 11,250 lb, 5/8" capacity, 4.25” tall by 2” wide, weighs 4.4oz. This spacer is designed to be used with the DMM Pinto Rig Pulley to keep the side plates from pinching together when using textile products. Rock Exotica's new triple-attachment swivel pulley combines swivel, rigging plate, and pulley into one great tool. The Hydra can be used on your rope bridge for a sliding connection point which also eliminates rope twisting, or even as a lanyard adjuster or to tend your friction hitch (though the swivel won't come into play in that setup). We're sure you'll find many other uses for this great new pulley. The Hydra can be loaded at any of the three rubber-lined carabiner holes on the swivel top, and has a maximum rope diameter of 1/2” (13mm), breaking strength of 28kN (6294 lb), and a WLL of (5kN 1124 lb). Compact prusik-minding pulley with NFPA rating. The wide base design maximizes the effectiveness of a Prusik hitch while a unique side plate formation allows the use of larger ropes in a compact pulley. An oversized bell-shaped top hole accepts a large rescue carabiner or multiple small carabiners. The single can be rigged with 2 carabiners in a way that the 2nd carabiner serves as a Becket. Solid side plates help prevent foreign object access and reduce snagging and are precisely tensioned for easy one-handed operation and secure placement at any point along the rope. Sealed ball bearings provide optimal efficiency. 4,500 lb breaking strength, 1/2” capacity, 3.75” tall by 2.55” wide, weighs 3.5 oz. NFPA 'L' rating. Compact prusik-minding pulley with NFPA rating. The wide base design maximizes the effectiveness of a Prusik hitch while a unique side plate formation allows the use of larger ropes in a compact pulley. An oversized bell-shaped top hole accepts a large rescue carabiner or multiple small carabiners. Solid side plates help prevent foreign object access and reduce snagging and are precisely tensioned for easy one-handed operation and secure placement at any point along the rope. Sealed ball bearings provide optimal efficiency. 10,575 lb MBS (becket strength 4,495 lb). 1/2” capacity, 4.65” tall by 2.55” wide, weighs 5.8 oz. Fitting right between the larger and smaller PMP pulleys, this mid-sized 2” PMP single pulley meets NFPA standards while remaining super lightweight and strong. The highest strength-to-weight ratio available! Great for progress capture and hauling systems, this pulley features solid side plates to reduce snagging and is tensioned to make one-handed use easier. Sealed ball bearings increase efficiency and decrease the chance of pulley failure. Oversized top hole will accommodate 2 large rescue carabiners or multiple small carabiners, and allows the carabiners to be rotated freely and completely. 8,093 lb MBS. 1/2" (13mm) capacity, 3.97" x 2.9" x 1.37" with a 2" aluminum sheave. Weighs 6.3 oz. Made in the USA. NFPA 'G'-rated pulley is super lightweight and strong, runs on sealed ball bearings. 10,341 lb MBS. 1/2" (13mm) capacity, 5.1" x 2.9" x 2.2" with a 2" aluminum sheave. Weighs 10.4 oz. Made in the USA. This larger PMP single pulley meets NFPA standards and has a wide base to increase effectiveness of prusiks up to 8mm, making it a great pulley for use in progress capture and hauling systems. Solid side plates reduce snagging and are tensioned to make one-handed use easier. Sealed ball bearings increase efficiency and decrease the chance of pulley failure. Oversized top hole will accommodate multiple carabiners, making this pulley more versatile in more situations. 8,542 lb MBS. 1/2" (13mm) capacity, 5.85" x 4.17" x 1.38" with a 3" aluminum sheave. Weighs 12.5oz. Made in the USA. Fits nicely between the Micro PMP and 3" PMP pulleys. Compact, strong, and backed by SMC's incredible quality guarantee. This larger PMP double pulley meets NFPA standards and has a wide base to increase effectiveness of prusiks up to 8mm, making it a great pulley for use in progress capture and hauling systems. Solid side plates reduce snagging and are tensioned to make one-handed use easier. Sealed ball bearings increase efficiency and decrease the chance of pulley failure. Oversized top hole will accommodate multiple carabiners, making this pulley more versatile in more situations. 13,488 lb MBS (6,969 lb becket strength). 1/2" (13mm) capacity, 7.1 x 4.17 x 2.2" with 3" aluminum sheaves. Weighs 20.8oz. Made in the USA. Aluminum body, sheave, bushing, stainless steel axle. WLL 750 lb. Breaking Strength 7,500 lb. Aluminum body, sheave, bearing, stainless steel axle. Stainless steel side plates, aluminum sheaves, bearing, stainless steel axle. WLL 1,100 lb. Breaking Strength 11,000 lb. The Petzl PRO pulley is a high-efficiency pulley that runs on sealed ball bearings, and has the advantage of being openable while still attached to the anchor. Thanks to the swinging side plate, the rope can be installed in the pro without unfastening it from the anchor. This side plate locks when the pulley is loaded, to prevent opening of the Pro pulley during use. CE, NFPA 'T'. 4,954 lb breaking strength, 1/2" max rope diameter, weighs 7.23 oz. Aluminum side plates, large sheave on sealed ball bearings. Extremely efficient, lightweight, and compact. This pulley has a place in any rescue kit. WLL 720 lb. Breaking Strength 7,200 lb. Aluminum side plates, sheave, sealed ball bearings, designed for hauling and pulling systems. Highly efficient sheave mounted on ball bearings. WLL 810 lb. Breaking Strength 8,100 lb. Aluminum side plates, sheave, sealed ball bearings, designed for hauling and pulling systems. Highly efficient sheaves mounted on ball bearings. Double sheaves, lower becket. WLL 990 lb. Breaking Strength 9,900 lb. 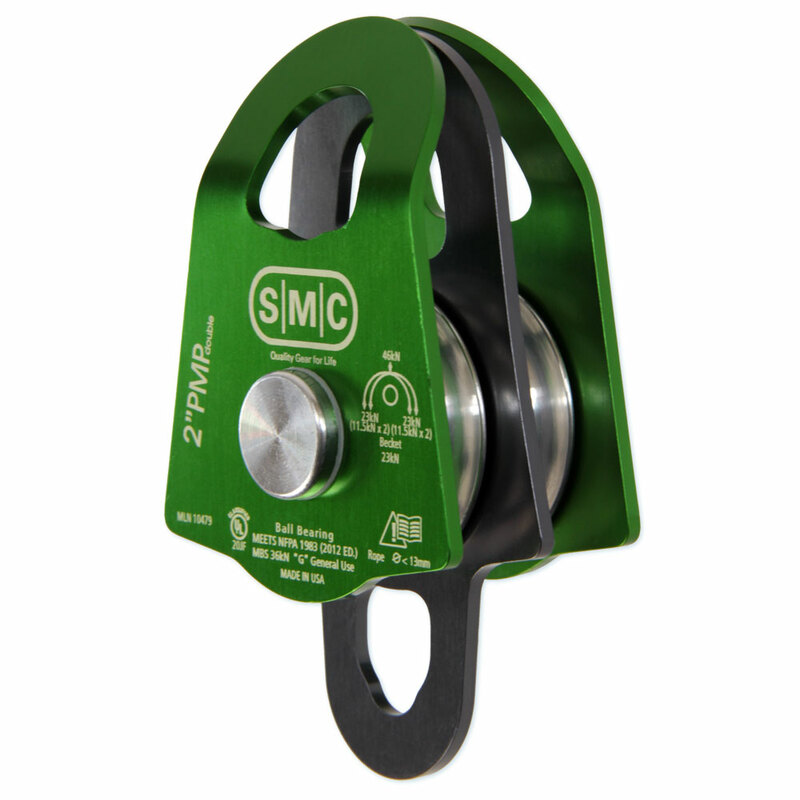 The CMI shackle pulley is the ultimate in compact strength. At 8,000 lb it is stronger than any other micro pulley. Weighing only 3.5 oz and measuring just 2.5”, it is also the smallest load-bearing pulley out there. Breaking strength 8,000 lb, max capacity 1/2”, 3.5” tall by 1.5” wide, weighs 2.56 oz. Designed for Tyrolean traverses on rope or making zip lines. Sheaves mounted on self-lubricating bushings for good efficiency. Maximum allowable speed: 10 m/s. Accepts up to three carabiners to facilitate use. WLL 2,225 lb. Breaking Strength 5,400 lb. Stainless Steel side plates, two 1 1/2” Stainless Steel sheaves, Bearing, and Stainless Steel axle. WLL 1,400 lb. Breaking Strength 14,000 lb.